Ultra Precision Extension Springs are made to strict tolerances from high-grade materials. Tight quality control is maintained throughout the manufacturing process. Ends are full twist loops. Loop OD is the same as body OD. 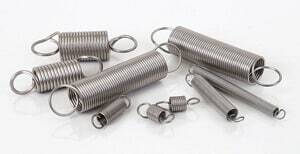 Ultra-Precision Extension Springs have an excellent fatigue life and are ideal for dynamic or heavy cycle applications. Other uses include maintenance, prototyping, and equipment repair.